Dehradun, April 11: Polling for Uttarakhand's five Lok Sabha seats- Tehri, Pauri-Garhwal, Almora (reserved), Nainital and Haridwar which began at 7 am today amid tight security concluded successfully at 5 PM. The counting of votes will take place on May 23. A voter turnout of 57.85% was recorded till 5 pm on Thursday. Chief Minister Trivendra Singh Rawat cast his vote at polling booth number 124 in Defence Colony in Dehradun. Till 11 AM, 23.78 percent voter turnout was recorded in the hill state. As per turnout till 1 PM, 41.27% polling was recorded in all the 5 seats in Uttarakhand. At 3 PM, the voter turnout was 46.59%. 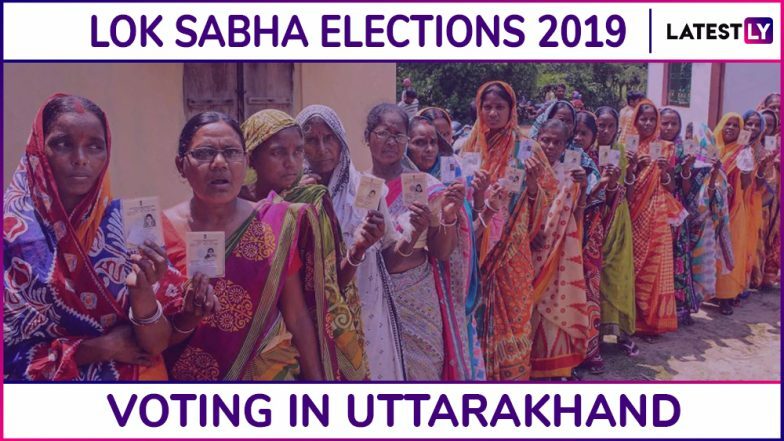 Lok Sabha Elections 2019 Phase-I Voting Live News Updates. In the run up to Lok Sabha Elections 2019, the main contest is between the Congress and the Bharatiya Janata Party (BJP) in the hill state. A total of 65 candidates are in the fray for five Lok Sabha seats in the hill state. According to reports, out of the total 11,238 booths in Uttarakhand, nearly 563 have been declared vulnerable and 969 critical. Most of the vulnerable and critical booths are mostly in the districts in the plains such as Udham Singh Nagar, Haridwar and Dehradun. Lok Sabha Elections 2019 Schedule: Voting In 7 Phases From April 11 to May 19, Counting And Results On May 23; Check All Dates For General Elections. This year, BJP has fielded two new faces, Ajay Bhatt (Nainital) and Tirath Singh Rawat (Pauri), while retaining three others. Meanwhile, the Congress has fielded three first-timers, Ambrish Kumar, Pritam Singh and Manish Khanduri, while retaining Harish Rawat and Pradeep Tamta, elections veterans. The Bahujan Samaj Party-Samajwadi Party combine too fielded five candidates. While the BSP will contest four seats, the SP will fight from Pauri. From the Nainital seat, Congress General Secretary Harish Rawat is facing state BJP Chief Ajay Bhatt. Both suffered defeats in the 2017 Assembly elections. The Congress has fielded Ambrish Kumar from Haridwar instead. Kumar, a former Samajwadi Party leader, joined the Congress more than a decade ago, but is not considered as strong candidate as Rawat. From the Tehri constituency, the Congress has fielded Pritam Singh rejecting former PCC President Kishore Upadhayay's claims. He faces a formidable challenge from BJP's Maharani Rajyalakshmi Shah who won the seat in 2012 (by-election) and 2014. In Pauri, former Chief Minister B.C. Khanduri's son Manish Khanduri is contesting against his father's protege and BJP secretary Tirath Singh Rawat. Though both the candidates claim to have his blessings, Khanduri senior, reportedly unwell, was missing when they filed their nomination papers. Almora will witness what is being billed as clash of two Tamtas. The Congress has fielded Pradeep Tamta to take on Union Minister of State for Textile Ajay Tamta. The BJP candidate had an easy victory in 2014 in the Narendra Modi wave. Though the BJP had won all the five seats in 2014, Congress candidates such as state party President Pritam singh and party general secretary Harish Rawat are giving anxious moments to the rival BJP candidates this time. The BJP may have an edge in the two seats of Garhwal-Pauri and Haridwar - mainly due to the entry of newcomers from Congress side.